« Day 183 – Alan W.
Day 184 – Jon H.
The Year of Giving does not focus on any one “type” of person. People often ask me how I select the recipients. Sure, some days I go out with a type of person in mind, however many times it is just a feeling I get when I am sitting next to somebody on the bus or watching a mother play with her child in a park. Having said this, I have given my $10 to a considerable amount of people who are currently or who have in the past experienced homelessness. a public or private place not designed for, or ordinarily used as, a regular sleeping accommodation for human beings. Although I don’t think that the government has came up with the best definition here, it is certainly better than the definition that usually comes to people’s mind when they hear that someone is homeless. The image of someone sleeping on the streets. The area that I have found particularly interesting to study here is the one that deals with those who lack “fixed, regular, and adequate nighttime residence.” So many people today fall into this category and they are often not counted in statistics on homeless populations. The Year of Giving has taught me an immense amount about the people who struggle with this every day. I often forget how fortunate I am to have such a comfortable environment to keep my belongings, prepare my meals and sleep at night. As a result of the writings, photographs and videos that I have done about the homeless I was nominated for the David Pike Excellence in Journalism Award. Although Maria Glod from the Washington Post ended up winning the award, I was extremely honored to have even been nominated for my work. I went to the award ceremony with my father and brother. It was a very nice evening. I took pictures which I can try to post here once I get my computer fixed. I thought I would look for a recipient for my $10 at the event, so I had my small black Moleskine journal with me to take notes. As it turns out, the notebook slid out of my bag and remained underneath my seat when we left the auditorium. I noticed that I was missing it immediately and had an idea that it was probably under the seat so I went back and checked but didn’t find anything. Now I was concerned, because I knew I had it with me. Maybe somebody turned it in, right? Well, just as I was looking around to ask someone if anyone had turned it in, a young man who I recognized from being the photographer at the event, walked over to me and gave me the book. Well, on my Moleskine notebook it is clearly marked that there is a reward for returning it to me. You guessed it, that reward is $10! I thanked Jon and happily handed him the $10. He explained that he was an intern working at Street Sense for the summer as a photographer. 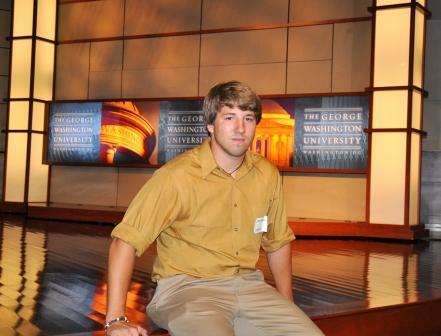 A photo journalism major at the University of North Texas, Jon is here in DC through a partnership with the George Washington University. Still holding his Canon Rebel XTi in his hands, he mentioned he was on his way to the reception to take more photographs. I didn’t want to hold him up so I tried to be quick. I found out that Jon recently transferred to the University of North Texas from Angelo State University in San Angelo, TX. He played rugby for two years there and hopes to continue playing at North Texas. “It’s different than football,” he says, “you have to learn how to hit the other guy differently.” He talks about the importance that strategy plays in the game as well. But even strategy doesn’t protect you from getting a little banged up. Jon has broken his nose three times (weird, so have I!) and had his AC separated off the clavicle. Off the field Jon’s artistic interest is not limited to photography. He also loves music. “I own a record store in Abilene, Texas” he says. “You mean old school vinyl records?” I asked. He nodded his head and confirmed my suspicion. This struck me as odd. CDs were already starting to dominate as the preferred physical medium for music by the time he was born! But this has nothing to do with that. This is more about the relationship someone has with music. There is something almost romantic about vinyl records. I was just surprised to discover that someone his age who grew up in an era full of hi-tech gizmos would feel so strongly about this format of music that he would own a record store. Let’s not forget how cool it is that at 19 he owns his own record store! Jon said he was going to use the $10 to get some food that week. As an unpaid intern he has to be careful with his spending. We talked about Washington, DC some. “The first time I came here was when I was in the eighth grade. I remember seeing the homeless and it made an impression on me.” He also took lots of photos while he was here. Jon was very excited to to return to Washington and work with an organization like Street Sense which does so much for the city’s homeless citizens. His internship will be up in August and he will return to Texas. With him he will take much more than the thousands of photos he has shot and the college credits that he has earned. He will take with him an experience that I believe will change the course of his life as it has changed mine. The opportunity to learn about and work with this city’s homeless population has opened my eyes and my heart in so many ways. I said goodbye to Jon and let him get to work. The Award Ceremony reception had left over food and coffee which I took with me a few blocks away to the park at 20th and Pennsylvania. There I found several people who were happy to receive some of the leftovers. As I was walking around the park I found one man laying in the grass with nothing but the clothes on his back. I was worried that he might not be ok, so I walked over and asked. The man awoke from his sleep and turned out to beAnthony from Day 6! He and I chatted for a while and he seemed well, although sufficiently inebriated. It was good to see him. I chatted with another man for nearly an hour and a half. It was now midnight and my brother and father were waiting for me across the street (they had went to dinner when I went to deliver the food and coffee). It was a great night! A special thanks to Jon for allowing me to post some of his photographs in this blog. Click here to check out more of Jon’s photography. Hey man its been awhile. Hope all is well in DC and with your giving. Sorry I never got to give you a photo lesson, it was just so crazy the whole time I was there. I’m working for the newspaper at UNT doing photography and multi-media news videos and playing for the UNT rugby team. I also just got a job working as a field representative for home improvement place in Lewisville. I go door to door to offer a free estimate on any projects they may have on their homes. My brother also graduated from film school and got signed to an agency here in Dallas. He just got cast in stage production and is about to audition for another. The record store is still in business and doing pretty good. I still haven’t found a location for here in Denton but the one in Abilene is doing well. Hope to hear back from you. Jon has some nice photos! Homeless-yes there are so many homeless that are not counted.